Beach Soccer ltd company was founded in November of 2015, with a goal to focus on beach soccer in Serbia. Serbian Ministry of Youth and Sports, the City of Belgrade and the Football Association of Serbia all gave significant support to establish a new sports discipline in Serbia. During the initial press conference, the director of Beach Soccer ltd, Aleksandar Radosevic, spoke about numerous projects that have already been arranged in the last couple of months, designed to significantly help promoting beach soccer in Serbia. 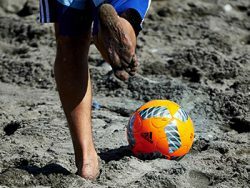 – Belgrade will host the Euro Beach Soccer Cup Belgrade 2016 from 24th to 26th June, which will include the teams of Portugal, Russia, Italy, Switzerland, Spain, Ukraine and Hungary, alongside with Serbia. – This modern sports object will be placed on the Makis side of Ada Ciganlija and will occupy an area of approximately 4.400 square meters. 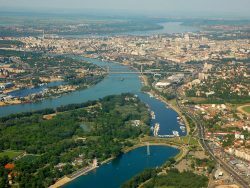 The start of the construction is planned several days ahead of now, and Belgrade will get a new stadium in 45 days. The stadium will have a capacity of 2.469 spectators and will be constructed following the UEFA standards. – The head coach of Serbian national team is Dejan Knezevic, Serbia’s most successful futsal tactician, six-time national champion and the assistant coach of futsal national team head coach, Aca Kovacevic from 2007. Knezevic will be able to count on two former captains of Crvena Zvezda, Dejan Milovanovic and Nikola Mijailovic, but also on Serbian futsal team captain and goalkeeper, Marko Peric and Nemanja Momcilovic. Starting on May 20th, a seven-day training sessions will be held, which will help determine 12 players who will wear Serbian national team jerseys. – A fact that I will be able to promote a sport like beach soccer is a great honor for me. Serbia is alongside with countries which are nurturing this sport, which is in my opinion completely logical because I am certain that we as a sport nation have the talent for beach soccer also. I didn’t get a chance to try it out more serious during my career, if one don’t count playing with kids during vacation or with friends between drinking two refreshing drinks on the beach. Still, I know that this sport demands the top level of technique and skills. I am sure that the months to come will bring us a lot of fun and enjoyment with beach soccer. I am confident that neither Pantelic nor I will be able not to try out this sport as soon as they finish building the stadium at Ada Ciganlija.